Many young children are fascinated by jokes... but they can be hard to understand! This book collects together a whole gaggle of gigglesome gags based on simple puns, clear vocabulary and easy-to-understand concepts. They are accompanied by cheeky, charming illustrations by child... read full description below. 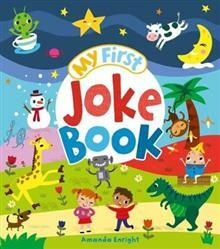 Many young children are fascinated by jokes... but they can be hard to understand! This book collects together a whole gaggle of gigglesome gags based on simple puns, clear vocabulary and easy-to-understand concepts. They are accompanied by cheeky, charming illustrations by children's illustrator Amanda Enright. Perfect for children aged 5+. Amanda completed a BA in Graphic Design at Camberwell college and an MA in animation at the Royal college of Art. She worked in the greeting card and animation industry for several years before going freelance. She lives with her family in West Sussex and works in her garden studio on a vast range of projects, many of which are children's books and products.